What will you put in your holiday baskets? Yes, it is August and finally we have local tomatoes in all of their splendor! We are bringing in multiple pallets of fresh mozzarella and burrata each week to pair with these lovely summer fruits. Yet, it is time to start planning for the winter holidays. If you are looking for certain specialty product, say a porcini or truffle cacciatorini, this is the week to place your order. Both the porcini and truffle cacciatore are products that require planning ahead. 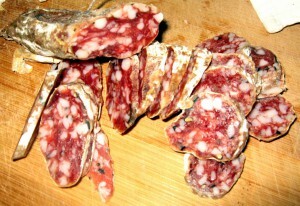 Columbus will start production on these coarse ground sausages very soon, as they require a minimum one month cure. We expect to have the sausages ready for distribution in mid-November, and we need to order them this week. They are ordered by the case, approximately 5#, with 10 links per case. The sausage has a wonderful subtle wine flavor and an enduring mushroom flavor. Orders for the Cacciatore are due by the end of the day Thursday, August 18. Click here for November order form, Click here for December order forms. For other items you may want to put in holiday baskets or run as specials for the holidays, give us a call!